Once you get out of Petalburg City, you'll come to Route 104 which is a route divided into two halves, with the Petalburg Woods as a divider. First, you should go to the beach and fight all of the Trainers, to gain some valuable Experience Points. Once you've beaten them all, pick the Pecha and Oran Berries from the Berry trees you see. Also, don't forget to check the beach for the three items hidden here. The house you'll notice just north of the beach belongs to the retired sailor Mr. Briney. Unfortunately, he isn't home right now. Remember this location, as later on, when you are heading to Dewford Town, you'll need his services. Dewford Town is on an island, so you can't get there by yourself until you have Surf. Talk to Mr. Briney after clearing the Rusturf Tunnel and he will take you there by boat. As you move north, you'll be in Petalburg Woods. The three items that are hidden in the sand that can be found by pressing in front of the last squares on the beach (squares meaning steps). These can be very useful if you can find them all. For Emerald Players, this is the first Pokémon from the Previous generations that you will encounter, having the edge over Ruby and Sapphire players, who have to wait until Route 116 to catch any. Unlike the Johto Marill, these Hoenn variety have a Pre-evolved form called Azurill, which requires special breeding to get hold of. This mouse is a Water type, and he has the addition of Hydro Pump at Level 45, lacking from his GSC Predecessors. He has Water Gun at Level 10, so he can help you out in the first gym. He also has the Powerful Rock move, Rollout at Level 15, so training him a little can make him even more useful. He's a bit rare, you might need to wait a bit before you find him. Good use if you want to train him. 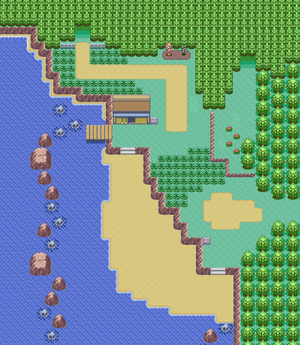 and for Ruby and Sapphire users, you can catch it in Route 117, which won't be too long from now. This is the first Normal/Flying Pokémon that you'll find in the game, reminiscent of Pidgey and Spearow from Firered and Leafgreen and the Red and Blue Versions, but this guy takes its roots more from Spearow. It's an aggressive little fighter, with the ability Guts, which increases attack when there is a status problem, adding to its good attack, moves like Wing Attack can do loads of damage. 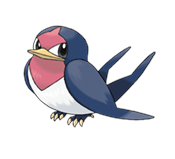 Unlike Marill, this bird is available in all versions, so everyone can get it, despite it also being a bit uncommon. Be sure to catch this, as it will eventually become a powerful Swellow. This page was last edited on 23 November 2018, at 23:36. This page has been accessed 204,597 times.